PHIVOLCS reported that a minor phreatic eruption at Bulusan occurred at 1029 on 5 June and was recorded by the seismic network for 12 minutes. The eruption could not be visually observed due to dense weather clouds covering the summit. Minor ashfall, a sulfuric odor, and rumbling sound were reported in barangays Monbon and Cogon in Irosin, while sulfuric odor was noted in barangay Bolos, Irosin. The Alert Level remained at 1, indicating abnormal conditions and a 4-km-radius Permanent Danger Zone (PDZ). Activity at Bulusan typically has included phreatic explosions from the summit crater and flank vents, ash-and-steam plumes, and minor ashfall in nearby villages (BGVN 41:03, 42:02). The danger zone was expanded in October 2016 when a fissure extended 2 km down the upper S flank that was the source of multiple phreatic explosions (figure 10, and see BGVN 42:02). During the first eight months of 2017, eruptive activity included similar episodes on 2 March and 5 June. Information was provided by the Philippine Institute of Volcanology and Seismology (PHIVOLCS). Throughout the reporting period of 1 January-8 September 2017 the Alert Level remained at 1, indicating a low level of volcanic unrest and a 4-km-radius Permanent Danger Zone (PDZ). Figure 10. A phreatic ash explosion from the SE vent at Bulusan on 17 October 2016 lasted 24 minutes. White steam plumes can be seen rising from other vents. Photo by Drew Zuñiga and provided by 2D Albay, as published in The Philippine Star (18 October 2016). According to PHIVOLCS, a weak phreatic eruption occurred at 1357 on 2 March 2017. The event was recorded by the seismic network as an explosion-type earthquake followed by short-duration tremor that lasted approximately 26 minutes. Visual observations were obscured by weather clouds, although a small steam plume rising from the SE vent was recorded by a webcam. On 5 June 2017 another weak phreatic eruption was recorded at 1029 by the seismic network for 12 minutes. The eruption again could not be visually observed due to dense weather clouds covering the summit. Minor ashfall, a sulfuric odor, and a rumbling sound were reported in the barangays (neighborhoods) of Monbon and Cogon, while sulfuric odor was noted in the barangay of Bolos. These three neighborhoods are within the municipality of Irosin, about 8 km SSW of the volcano. According to a news account (Manila Bulletin), precise leveling data obtained during 29 January to 3 February 2017 indicated deflationary changes since October 2016. PHIVOLCS reported that precise leveling data obtained during 14-23 June 2017 indicated inflation since February 2017. According to PHIVOLCS, continuous GPS measurements have indicated an inflationary trend since July 2016. Sulfur dioxide emissions on 31 July and 20 August, reported by PHIVOLCS, averaged 82 tonnes/day, which according to a news account (Manila Bulletin) was the same as measured on 29 April 2017. The seismic monitoring network recorded three volcanic earthquakes on 7-8 September. Weak steam plumes from the active vents rose to 50 meters and drifted SW.
Information Contacts: Philippine Institute of Volcanology and Seismology (PHIVOLCS), Department of Science and Technology, University of the Philippines Campus, Diliman, Quezon City, Philippines (URL: http://www.phivolcs.dost.gov.ph/); Manila Bulletin (URL: http://mb.com.ph/); Philippine Star (URL: http://www.philstar.com/). PHIVOLCS reported that a phreatic explosion occurred at 1440 on 29 December from a vent on Bulusan's upper SE flank. The seismic network recorded the event as an explosion-type earthquake that lasted about 16 minutes. A grayish ash plume rose 2 km above the vent and drifted WSW, causing minor amounts of ash to fall in areas downwind including the barangays of Cogon, Tinampo, Bolos, Umagom, Gulang-gulang, and Monbon of Irosin, and Caladgao and Guruyan of Juban. Residents of Guruyan, Juban, Monbon, and Tinampo of Irosin noted a sulfur odor. The Alert Level remained at 1, indicating abnormal conditions and a 4-km-radius Permanent Danger Zone (PDZ). PHIVOLCS reported that a phreatic explosion occurred at 0458 on 19 October from the vents on Bulusan's upper SE flank. The seismic network recorded the event as an explosion-type earthquake that lasted nine minutes. Dense weather clouds obscured views although limited observations indicated that the plume rose 1 km. A 20-minute-long phreatic explosion occurred from the summit crater at 1234 on 21 October. A thin layer of ash was reported in Casiguran and Gubat, and trace amounts of ash fell in barangays in Barcelona, Casiguran, and Gubat. At 1531 on 23 October a 15-minute-long phreatic explosion from the summit vent produced an ash plume that rose 2.5 km and drifted WSW. Small pyroclastic flows traveled about 2 km down the flank. Trace ashfall was reported in multiple barangays in Irosin Town, ashfall 0.5 mm thick was reported in the municipality of Juban, and the most ash, 1 mm thick deposits, were found in barangay Puting Sapa, Juban. A second and much smaller explosion was recorded at 1539 from the SE vent and generated an ash plume that rose 500 m. Rumbling and a sulfur odor was noted in several nearby areas. The Alert Level remained at 1, indicating abnormal conditions and a 4-km-radius Permanent Danger Zone (PDZ). PHIVOLCS reported that during 12-16 October the seismic network at Bulusan recorded 2-6 volcanic earthquakes per day. During 12-13 October steam plumes rose as high as 500 m above the active vents and drifted SE and SSE. The network recorded 24 volcanic earthquakes from 16 to 17 October. At 0736 on 17 October a 24-minute-long phreatic explosion at the SE vent generated an ash plume that rose 1 km. PHIVOLCS noted that while the SE vents are within the 4-km-radius Permanent Danger Zone (PDZ) they are part of a fissure that extends 2 km down the upper S flank. Eruptions from this area pose a greater risk to the populated barangays of Mapaso and Patag in Irosin, and San Roque in Bulusan. In response the Extended Danger Zone (EDZ) was increased and as of 18 October stretched an additional 2 km past the PDZ. The Alert Level remained at 1, indicating abnormal conditions and a 4-km-radius Permanent Danger Zone (PDZ). On 5 October, PHIVOLCS reported that since the morning of 30 September a fissure on Bulusan's SE flank had been venting low steam plumes with minor amounts of ash. Also during this time a strong sulfur odor was noticed in barangay Mapaso, Irosin. A 15-minute-long, minor phreatic eruption was recorded by the seismic network on the morning of 6 October. Weather clouds prevented visual observations. Ashfall was reported in some areas of Gubat and rumbling was noted in barangay San Roque, Bulusan. The Alert Level remained at 1, indicating abnormal conditions and a 4-km-radius Permanent Danger Zone (PDZ). PHIVOLCS reported that, beginning at 1654 on 16 September, a four-minute-long phreatic explosion at Bulusan generated a dark gray ash plume that rose 1.5 km and drifted NE. Ashfall was reported in the municipalities of Casiguran, Gubat, and Barcelona. The Alert Level remained at 1, indicating abnormal conditions and a 4-km-radius Permanent Danger Zone (PDZ). PHIVOLCS reported that on 20 July white-to-light-gray plumes rose to low levels above Bulusan and drifted WNW. During 21-25 July diffuse white plumes rose as high as 250 m above the crater and drifted NW and SW. The Alert Level remained at 1, indicating abnormal conditions and a 4-km-radius Permanent Danger Zone (PDZ). PHIVOLCS reported that during 0900-0918 on 23 June Bulusan's NW summit vent vigorously emitted dirty-white steam plumes that drifted down the WNW flank. The color of the plume suggested low-energy ash emissions; no seismic signals surrounding the event were detected, indicating a shallow source. Minor amounts of ash fell in the neighborhoods of Poblacion (11 km NW), Añog (12 km NW), and Bacolod (13 km NW) in the Municipality of Juban, and Mabini (12 km NNW) in the Municipality of Casiguran. A sulfur odor was detected in the neighborhoods of Mabini, Bacolod, Añog, and Puting Sapa (Juban). Steam plumes rose as high as 200 m during 25-26 June and drifted NW; steam plumes drifted down the flank on 28 June. The Alert Level remained at 1, indicating abnormal conditions and a 4-km-radius Permanent Danger Zone (PDZ). PHIVOLCS reported that a five-minute-long phreatic explosion at Bulusan began at 1135 on 10 June, and generated an ash plume that rose 2 km and drifted NW. The Alert Level remained at 1, indicating abnormal conditions and a 4-km radius Permanent Danger Zone (PDZ). PHIVOLCS reported that at 1701 on 22 February explosions at Bulusan generated a steam-and-ash plume that rose 500 m above the WNW fissure vent. The event was accompanied by a high-frequency earthquake followed by low-frequency earthquakes that lasted 4 minutes and 21 seconds. Rumbling sounds were heard in Puting Sapa, Juban, and Bolos, Irosin, and minor amounts of ash fell in barangays Puting Sapa, Sagkayon, and Caladgao in Juban, and barangay Bolos in Irosin. The report noted that no volcanic earthquakes were recorded prior to the eruption, though increased seismicity had been detected during 20-21 February. The Alert Level remained at 1, indicating abnormal conditions and a 4-km radius Permanent Danger Zone (PDZ). PHIVOLCS reported that at 1310 on 17 July an explosion at Bulusan, detected by the seismic network for 11 minutes, generated an ash plume that rose 200 m above the crater and drifted WNW. Ashfall was reported in areas to the N and NE in the Sorsogon Province, including Inlagadian (municipality of Casiguran), Tigkiw, Tugawe, Nazareno, Bugtong, and Rizal (municipality of Gubat), and Fabrica, San Isidro, Sta. Cruz, and San Ramon (municipality of Barcelona). The Alert Level remained at 1, indicating abnormal conditions and a 4-km radius Permanent Danger Zone (PDZ). PHIVOLCS reported that the seismic network at Bulusan recorded an explosion-type event that lasted for two minutes on 18 June; dense clouds obscured visual observations of the summit area. A phreatic explosion that occurred at 1455 on 19 June, and lasted for seven minutes, produced a 1.5-km-high grayish ash plume that drifted WSW. A low-level ash cloud on the upper NW flank, possibly from a short pyroclastic flow, was also observed. Minor amounts of ash fell in the neighborhoods of Bacolod, Buraburan, Mapili, Puting Sapa, and Juban. The event was followed by a voluminous gray white emission, which later turned completely white, that rose 250 m and drifted SW. At 1315 on 21 June an event which lasted 111 seconds generated a steam-and-ash plume that rose 150 m and drifted E. Trace amounts of ash fell in San Jose, San Francisco, Bulusan Proper, Sapngan, San Rafael, and Dapdap. The Alert Level remained at 1, indicating abnormal conditions and a 4-km radius Permanent Danger Zone (PDZ). PHIVOLCS reported that at 1102 on 16 June a 10-minute-long phreatic explosion from Bulusan generated a steam-and-ash plume that rose 1 km and drifted WSW. This event was accompanied by rumbling sounds reported by residents in Cogon, Irosin on the WSW flank. A second and smaller event occurred at 1120 and, based on seismicity, lasted for one minute. The Alert Level remained at 1, indicating abnormal conditions and a 4-km radius Permanent Danger Zone (PDZ). During 13-15 and 17-19 May PHIVOLCS reported that six or fewer volcanic earthquakes were recorded at Bulusan. Weak steam emissions were occasionally observed rising from the SW vent and from a vent on the upper NW flank; plumes drifted SW, WNW, or drifted downslope. PHIVOLCS maintained Alert Level 1, indicating abnormal conditions, and reminded the public of the 4-km radius Permanent Danger Zone (PDZ). PHIVOLCS reported that at 2146 on 6 May a phreatic explosion from a vent on the upper NW flank of Bulusan generated an ash plume that rose 250 m before drifting W. Seismic data indicated that the event lasted 3.5 minutes. Traces of ash were reported in Sitio Tulay of Bagsangan Barangay, and in the Cogon, Monbon, and Tinampo Barangays. The Alert Level was raised to 1, indicating abnormal conditions and a 4-km radius Permanent Danger Zone (PDZ). During 8-9 and 11-12 May diffuse white emissions rose from vents on the SW and upper NW flanks. On 13 July, PHIVLOCS reported that several days of elevated seismicity at Bulusan continued. During the previous 24 hours, 13 volcanic earthquakes were recorded by the local network. GPS and leveling surveys determined that the volcano was slightly inflated. Alert Level 0 and the 4-km restricted zone, the Permanent Danger Zone (PDZ), were maintained due to the possibility of sudden and hazardous steam-driven or phreatic eruptions. On 13 May, PHIVOLCS reported that an explosion from Bulusan's summit crater was accompanied by a rumbling sound audible up to 5 km away. The event was recorded by the seismic network as an explosion-type earthquake lasting for about 10 minutes. Cloud cover prevented observations of the summit area. Field investigation conducted immediately after the explosion confirmed the presence of thin ash deposits (0.5- 2.5 mm) approximately 9 km away from the crater in the NW and SW sectors. Several barangays in the municipalities of Juban and Irosin reported light ashfall. The Alert Level remained at 1 (on a scale of 0-5). Entry into the permanent danger zone, defined by a 4-km radius around the volcano, was prohibited. During 15-16 May the seismic network detected four earthquakes. Then, on 16 May, the number of earthquakes rapidly increased to 80 in a seven-hour period. On 17 May PHIVOLCS reported that 144 earthquakes were recorded in the previous 24 hours. Steam rose from the active vents. Based on notices from the Manila airport (RPLL), the Tokyo VAAC reported that on 20, 22, and 26 April ash from Bulusan was observed. PHIVOLCS reported that only diffuse steam rose from the SE vents during 20-23 April. During cloud breaks on 26 April, diffuse steam plumes from the NW and SE vents were observed rising about 50 m and drifting WSW. During 12-19 April, PHIVOLCS reported that up to six daily volcanic earthquakes at Bulusan were detected by the seismic network. Although cloud cover mostly prevented observations of the summit area, steam was observed rising from NW and SE thermal vents during 15 and 17-18 April. Based on notices from the Manila airport (RPLL) and reports from PHIVOLCS, the Tokyo VAAC reported that ash was observed on 13 and 15 April. Based on notices from the Manila airport (RPLL), the Tokyo VAAC reported that during 25-26 March ash from Bulusan was observed. PHIVOLCS reported that cloud cover prevented ground-based observations. Based on notices from the Manila airport (RPLL) and analyses of satellite imagery, the Tokyo VAAC reported that on 18 and 20 March ash from Bulusan was observed. PHIVOLCS reported that cloud cover prevented ground-based observations during 18-20 March. During 2-8 March, PHIVOLCS reported that up to four daily volcanic earthquakes at Bulusan were detected by the seismic network. Although cloud cover mostly prevented observations of the summit area, steam was observed rising from thermal vents during 2-4 and 7-8 March. Based on notices from the Manila airport (RPLL) and satellite image observations, the Tokyo VAAC reported that during 3-4 March ash was observed. During 24 February-1 March, PHIVOLCS reported that up to five daily volcanic earthquakes at Bulusan were detected by the seismic network. There were 13 lahar-related seismic signals detected during 27-28 February. Continuous heavy rain caused small lahars on the flanks and in river channels, including the Cogon and Monbon rivers to the SW. Cloud cover prevented observations of the summit area during 24-28 February. Based on notices from the Manila airport (RPLL), the Tokyo VAAC reported that on 24 and 28 February ash was observed. However, ash was not identified in satellite imagery. During 17-20 February, PHIVOLCS reported that up to three daily volcanic earthquakes at Bulusan were detected by the seismic network. Cloud cover mostly prevented observations of the summit area, although steam rose from NW thermal vents on 19 February. An explosion on 21 February produced a gray ash plume that rose 3 km above the crater and drifted SW. Rumbling sounds were heard up to 10 km away in the town of Juban (NW). The event was recorded by the seismic network as an explosion-type earthquake lasting for about 19 minutes. Field investigations confirmed ash deposits in the towns of Irosin (up to 5 mm), 8 km SSW, and Bulan (up to 3 mm), 22 km SW. Traces of ashfall were also reported in the municipalities of Juban and Magallanes (24 km WNW), and in Masbate City (70 km SW), Masbate. According to news articles, about 2,000 people evacuated. During 21-22 February 16 volcanic earthquakes were detected by the seismic network. The Alert Level remained at 1 (on a scale of 0-5). During 25-27 and 29-30 January, PHIVOLCS reported that up to five daily volcanic earthquakes at Bulusan were detected by the seismic network. Cloud cover prevented observations of the summit area. A deformation survey conducted during 25-29 January showed slight deflation relative to a December 2010 survey. The Alert Level remained at 1 (on a scale of 0-5). During 11-17 January, PHIVOLCS reported that up to 2 daily volcanic earthquakes at Bulusan were detected by the seismic network. Cloud cover prevented observations of the summit area. An explosion on 18 January was accompanied by a rumbling sound audible in Monbon, a barangay (neighborhood) in the municipality of Irosin, to the S. Cloud cover prevented observations of the crater. Trace amounts of ashfall were observed in Monbon. The Alert Level remained at 1 (on a scale of 0-5). Based on notices from the Manila airport (RPLL), the Tokyo VAAC reported that on 29 and 30 December ash from Bulusan was observed. PHIVOLCS noted that inclement weather prevented views of the summit area during 29-31 December. Eight volcano-tectonic earthquakes were detected by the seismic network during 30-31 December. On 17 December, PHIVOLCS reported that an explosion from Bulusan, recorded for about 3 minutes by seismographs, produced an ash-and-steam plume that rose 500 m above the crater and drifted SW. Steam rose from the NW and SE vents, and again from NW vents on 19 December. During 8-12 December, PHIVOLCS reported that 1-2 volcanic earthquakes from Bulusan were detected by the seismic network. Cloud cover prevented visual observations. On 13 December, 7 volcanic earthquakes were detected. Steam rose from the crater and known thermal vents. The Alert Level remained at 1 (on a scale of 0-5). PHIVOLCS reported that volcanic earthquakes from Bulusan were detected during 1-6 December; no earthquakes were recorded on 7 December. Steam from known thermal vents rose 100 m and drifted SW on 1 December. Cloud cover prevented visual observations during 2-4 and 6-7 December. Diffuse steam rose from the crater and from known vents on 5 December. The Alert Level remained at 1 (on a scale of 0-5). On 24 November, PHIVOLCS reported that an explosion from Bulusan, recorded for almost six minutes by seismographs, produced an ash plume that rose 1 km above the crater, drifted SW, and dissipated. Ashfall was not observed outside of the permanent danger zone, defined as a 4-km radius from the summit, suggesting that ashfall was confined to the upper flanks. On 26 November steam was emitted from known thermal vents and the crater. A steam plume rose 150 m above the NW vent and drifted SW. Later that night an explosion-type earthquake was recorded by the seismic network; cloud cover prevented visual observations of the crater. On 28 November steam rose from the SE and SW vents. During 29 November-1 December steam rose from both the NW vents and thermal vents. On 16 November, white steam rose from Bulusan's NW vent, but no steaming was observed from the crater and SE vent. Cloud cover prevented observations the next day. On 18 November weak steaming from the crater and known thermal vents produced plumes that drifted downslope to the SW. Cloud cover obscured views of the crater during 19-20 November. An explosion-type earthquake on 21 November was coincident with rumbling sounds and an ash plume that rose 2 km above the crater. Ashfall up to 3 mm thick was reported in multiple areas. According to news reports, about 500 families evacuated and some local roads were impassable. Steam was emitted from the crater and known thermal vents during 22-23 November. During 10-11 November, PHIVOLCS reported that 18 volcano tectonic earthquakes from Bulusan were detected by the seismic network. On 11 November white steam plumes rose 150 m above the crater and drifted ENE. During an aerial survey, scientists saw that recent explosions resulted in the joining of two of the 2006-2007 craters into one. They also noted that deposits from an explosion on 9 November did not contain juvenile material. On 12 November an ash explosion produced an ash-and-steam plume that rose 700 m above the crater and drifted SW. Multiple neighborhoods to the W and SW reported light ashfall. Four volcano-tectonic earthquakes were detected during the previous 24 hours. Steam plumes rose to a maximum height of 100 m above the crater. Some steaming was seen during 13-14 November. White steam rose from the NW vent, but no steaming was observed from the crater and SE vent on 14 and 15 November. An explosion late at night on 15 November was followed by ashfall in nearby neighborhoods. Cloud cover prevented observations of the summit area the next morning. The Alert Level remained at 1 (out of 5). PHIVOLCS reported an explosion-type earthquake at Bulusan on 6 November coincident with a steam-and-ash plume that rose 600 m above the crater at 0811. Trace amounts of ashfall were reported in multiple areas 6-10 km NW. The Alert Level was raised from 0 to 1 (out of 5), and PHIVOLCS reminded the public not to enter the permanent danger zone, defined as a 4-km radius around the volcano. White steam plumes were observed rising 200 m above the crater before 1400, when cloud cover prevented observations. On 7 November, PHIVOLCS noted that seismic activity had increased during the previous 24 hours. A phreatic explosion on 8 November was produced a brownish-to-light-gray plume that rose 700 m above the crater. Several neighborhoods to the NW, W, and WSW reported ashfall. Steam rose from the crater after the explosion. On 9 November two consecutive ash explosions, accompanied by rumbling sounds, produced ash plumes that rose as high as 1 km above the crater and drifted SW. Ashfall up to 2 mm thick was reported in areas to the SW and WNW. According to a news article, at least seven minor earthquakes near Bulusan during 6-7 January prompted authorities to enforce the no-entry policy within the permanent danger zone, defined by a 4-km radius around the volcano. The Alert Level remained at 1 (out of 5). Based on seismic interpretation, PHIVOLCS reported two explosions from Bulusan on 4 October. Thick clouds obscured observations of the summit. According to news articles, ashfall was reported in several villages. An explosion from Bulusan on 31 July produced an ash plume that rose to an altitude of 6.6 km (21,700 ft) a.s.l. The plume drifted WSW and WNW, causing light ashfall. According to a news article, white steam plumes rose from active craters and fissures on 2 August. The Alert Level remained at 1 (out of 5). On 13 July, PHIVOLCS lowered the Alert Level for Bulusan from 2 to 1 (out of 5) due to a decline in activity including decreased seismicity, below baseline sulfur dioxide output, and deflation relative to the previous survey. Steam plumes from active vents and fissures were observed. According to news articles, scientists from PHIVOLCS conducted an aerial investigation of Bulusan and discovered lahar deposits and three steaming fissures. Lahars were previously reported from the municipalities of Irosin and Juban on 22 May. Scientists also observed steam plumes that rose to altitudes of 1.6-1.7 km (5,200-5,600 ft) a.s.l. and drifted NW and NE. PHIVOLCS reported that the S flank inflated 3 mm. PHIVOLCS reported on 20 May that seismicity from Bulusan remained high following the explosion on 12 May. Ground deformation measurements conducted on 17 May on the NE flank revealed 4 mm of inflation compared to the previous measurement on 7 April. The Alert Level was raised from 1 to 2 (out of 5) due to the increased seismicity and inflation. PHIVOLCS reported that an explosion from Bulusan on 12 May produced an ash plume that rose to an altitude of 5.6 km (18,400 ft) a.s.l. and drifted WSW and WNW. The activity was accompanied by rumbling sounds and was recorded by the seismic network as an explosion-type earthquake that lasted about 35 minutes. An increase in seismicity was noted during 9-12 May. Ashfall (trace-2 mm thick) was reported in 11 barangays from the municipalities of Irosin and Juban. PHIVOLCS reported on 17 April that seismicity from Bulusan increased significantly during 16-17 April. Ground deformation surveys conducted in March and April indicated 4 mm of inflation on the NNE flank. Steam plumes from the crater and fissures rose to altitudes of 1.8 km (5,900 ft) a.s.l. and drifted WSW. According to news articles, eruptions from Bulusan on 8 April produced ash plumes that rose to altitudes of 3.1-6.6 km (10,200-21,700 ft) a.s.l. Based on news articles, ash fell on the SW slopes and villages near Bulusan on 15 March. According to the interpretation of a resident volcanologist, the ashfall was not caused by explosions, instead voluminous steaming during 12-15 March "agitated the ash deposits on the crater wall." PHIVOLCS reported that an explosion from the summit of Bulusan on 24 January lasted about 10 minutes based on seismic interpretation. Observation was inhibited due to cloud cover. Ashfall was reported from areas SW. According to a news report, a plume of gas and "white ash" was emitted from Bulusan on 22 December. According to new articles, Bulusan emitted ash that was accompanied by rumbling noises and lightning flashes on 20 December. Clouds hindered a view of the summit. Ash deposits up to 4 mm thick were noted in several villages at the foothills. On 1 November, PHIVOLCS reported two explosion-type earthquakes from Bulusan at 1914 and 2345 on 31 October. Trace amounts of ashfall was reported from neighborhoods in the municipalities of Casiguran, Malapatan, and Irosin. PHIVOLCS reported that during 25-26 October, a lahar from Bulusan deposited sediments 15 cm (6 in) thick along a tributary leading to the Gulang-gulang River. According to news articles, the lahar mobilized boulders as large as trucks and caused at least 96 people to evacuate. During 30-31 October, ash explosions generated a light gray ash-and-steam plume that rose to 2.3 km (7,400 ft) a.s.l. and drifted NNE. Later field inspection revealed ashfall (trace to 1 mm) in the N sectors of the volcano, including areas in the municipalities of Casiguran and Gubat. PHIVOLCS reported an explosion from Bulusan on 19 October. The following day, steam plumes drifted W and WSW. On 23 October, an explosion produced a brownish ash plume that rose to about 2.6 km (8,400 ft) a.s.l. and drifted SE and SW. Light ashfall (trace to 0.5 mm thick) from both explosions was reported from neighborhoods in the municipality of Irosin. PHIVOLCS reported that an explosion from Bulusan on 10 October produced an ash-and-steam plume that rose to 4.5 km (15,000 ft) a.s.l. and drifted mainly SE and SSW. Light ashfall (1.5-5.0 mm thick) was reported in neighboring towns downwind. Based on seismic data, the activity lasted for 9 minutes. On 11 and 12 October, steam plumes drifted SW and SSW. On 10 October, an eruption plume from Bulusan that was visible on satellite imagery reached altitudes of 3 km (10,000 ft) a.s.l. and drifted SW and SSE. PHIVOLCS reported that steam plumes from Bulusan reached up to 350 m above the summit (6,300 ft a.s.l.) on 30 August and 1 September. The plumes drifted NW and SE, respectively. On 29 July, PHIVOLCS reported that the Alert Level at Bulusan was lowered from 2 to 1 (out of 5 levels) due to a gradual decrease from 28 June of all monitored parameters to near-baseline levels. Based on interpretations of seismic data, small explosions occurred at Bulusan on 28 and 29 June. No ashfall was reported. According to news reports, on 24 June rocks and large boulders that were mobilized on the flanks of Bulusan by heavy rains prompted 100 residents of Cogon village to evacuate. On 26 June, lahars occurred along a tributary leading to the Gulang-Gulang River in Irosin town. An explosion from a fissure W of the summit vent of Bulusan lasting approximately 13 minutes on 13 June produced an ash-and-steam cloud that reached a height of 1.5 km above the summit (10,100 ft a.s.l.) and drifted NW. Ashfall up to 7 mm thick accumulated in neighborhoods in the municipality of Juban. On 18 June, an ash producing explosion that lasted approximately 11 minutes produced an ash-and-steam cloud that also reached a height of 1.5 km above the summit (10,100 ft a.s.l.) and drifted W. Ash up to 5 mm thick fell on a W flank village. On 20 June, a mild ash-and-steam explosion lasted approximately 17 minutes. Close to 900 people were evacuated due to the 18 June activity. On 20 June, officials declared a state of disaster for Irosin, Casiguran, and Juban towns in Sorsogon province. Bulusan remained at Alert Level 2 (out of 5 levels) during 14-20 June. According to PHIVOLCS, an ash-and-steam cloud from Bulusan on 7 June reached a height of approximately 2 km above the summit (11,700 ft a.s.l.) and drifted N and NW. Light ashfall was reported 5 km N and trace amounts as far as 20 km N. The Alert Level was raised to 2 (scale 0 to 5), which means restricted entry within 4 km of the summit. On 10 June, an ash-and-steam cloud reached a height of ~1 km above the summit (8,400 ft a.s.l.) and drifted N and NE. A news article reported one death caused by an asthma attack from exposure to ash. PHIVOLCS reported that an ash-and-steam cloud emitted from Bulusan on 31 May reached a height of 1.5 km above the summit (10,100 ft a.s.l.). Light ashfall, from trace amounts to 1.5 mm thickness, fell in areas W and NW of the volcano. Bulusan remained at Alert Level 1, with a Permanent Danger Zone of 4 km around the summit. According to news reports, on 29 April at 1044 an explosion at Bulusan produced an ash plume that rose ~1.6 km above the volcano (or 10,400 ft a.s.l.). Ash fell on nearby villages. People are not permitted to enter within 4 km of the volcano's crater. On 21 March at 2258, a modest ash explosion occurred at Bulusan's summit crater. The phreatic explosion produced an ash cloud that rose ~1.5 km above the volcano (or 10,050 ft a.s.l.). Based on interpretations of seismic data, the event lasted ~20 minutes. It was accompanied by lightning and rumbling sounds. Ash drifted N, W, and SW of the volcano, and ~1 hour after the explosion light ash fell (producing ~5-mm-thick deposits) in Barangays (neighborhoods) Cogon, Tinampo, Gulang-Gulang, and Bolos in the town of Irosin. Ash also fell in Barangays Puting Sapa and Bura-Buran of Juban town, and other neighboring barangays under the municipalities of Irosin and Juban, Sorsogon. Three explosion-type earthquakes were also recorded on the 21st, at 2330, 2332, and 2337, but the accompanying eruptive events were not observed because the summit was obscured. Bulusan ejected a grayish steam and ash cloud for about 30 minutes on 29 July, beginning at 1155. The cloud rose several hundred meters above the crater and deposited 1-7 mm of ash NE of the volcano. The eruption was accompanied by rumbling. Steam emission persisted after the eruption, and as of 3 August, white to dirty white vapor was being continuously emitted to about 100 m above the crater. COMVOL delineated a danger zone within 5 km of the summit, to be evacuated in the event of a major eruption. Bulusan last erupted in December 1933. Information Contacts: G. Andal, COMVOL, Quezon City; AFP. A voluminous ash-laden cloud rose 2,500-3,000 m above the crater rim on 14 August, then was blown NE by the prevailing wind. The eruption, accompanied by hissing and rumbling sounds, began at 0545 and lasted about 30 minutes. A seismograph 5 km SSE of the crater was saturated by an explosion-type earthquake. Further Reference. Aguila, L.G., 1978, The 1978 eruptions of Bulusan volcano: The COMVOL Letter, v. 10, nos. 3-4, p. 4-8. Bulusan began to erupt at 1301 on 27 December, ejecting significant amounts of ash to about 1 km above the summit. Ash was blown WSW by the prevailing wind. The eruption lasted for 1 hour and 13 minutes, and was accompanied by hissing and rumbling. As of early January, some activity was continuing. The eruption continued with a second explosion on 12 January at 1640. Ash rose about 500 m above the crater rim, then drifted NNW. COMVOL had predicted further activity in the Bulusan Volcano Bulletin dated 4 January, based on patterns exhibited during previous eruptions, especially the 1878 eruption. Citing a COMVOL official, Kyodo radio reported that a third explosion occurred on 7 February, apparently ejecting ash to 6 km. Ash emission was continuing early the next day. Residents left the area, reportedly because of 28 volcanic earthquakes and two tectonic events. Information Contacts: O. Peña, COMVOL, Quezon City; Kyodo Radio, Tokyo. Occasional explosions continued through March. The 7 February explosion began at 0215, after an increase in the number of volcanic earthquakes. Cauliflower-shaped, ash-laden clouds rose about 6 km above the crater rim before drifting SSW. Rumbling and hissing sounds accompanied the activity. Milder ejection of ash-laden steam clouds started at 1102 the next day, with light ashfall continuing until late afternoon on the volcano's SW sector. Another weak ash ejection occurred 9 February. Clouds and rain made observation of the summit and collection of ashfall data difficult in March. A strong odor of H2S was detected at San Benon station, 6 km SSW of the crater, at 0945-0950 and 1030-1200 on 10 March, but no ashfall was reported. On 22 March, light ashfall occurred from 1120 to 1135. Three weak ejections of ash-laden steam clouds took place on 26 March. At 0449, a cloud rose to approximately 400 m above the crater rim before winds blew it NW. A second steam and ash column reached 500-700 m above the rim about 1200, and a third was ejected to 300 m height two hours later. About 2 mm of ash fell on a settlement 8 km NNW of the crater. At 1525 the next day, a volcanic earthquake of intensity I on the Modified Rossi-Forel (MRF) scale was felt at Lake Bulusan station, 4.5 km SE of the crater. Rumbling and hissing sounds accompanied the earthquake. Ejection of ash-laden clouds was visible through weather clouds at the summit. Almost daily mild ejection of ash-laden steam clouds characterized activity from 2 April until late in the month. The clouds rose 100-1,500 m above the summit. On 4, 5, 15, 17, and 22 April, light ashfalls took place on villages as much as 8 km from the crater in the volcano's NW and SW quadrants. Activity was sometimes accompanied by volcanic earthquakes, including B-type events at 1243 on 2 April and 0722, 0950, 1007, and 1627 on 4 April, and by hissing sounds. At 1950 on 29 April, Bulusan erupted a series of dark, cauliflower-shaped ash clouds, forming a column that reached 3-4 km above the summit. About 2.5 mm of ash fell on SW flank villages. Hissing and intermittent rumbling sounds were heard during the ash ejection. The 29 April activity was preceded by about three days of increased seismicity, when seismographs recorded 170 volcanic earthquakes. Two of these were felt at intensity I on the Rossi-Forel scale at a COMVOL station. Occasional mild emission of ash-laden steam clouds continued through June. During June, some light ashfalls occurred on the S and SW flanks. An earthquake swarm began on 6 July, when 108 volcanic events were recorded in a 24-hour period. Six events were felt at intensities of I-IV on the MRF scale and were accompanied by rumbling. Seismicity peaked on 10 July with 189 recorded shocks, ten felt at intensities I-IV. The swarm declined gradually after the 10th. On 19 July, ash-rich steam clouds rose about 6 km above the summit. About 3 mm of ash fell on villages to the SE. Seismicity increased again on 22 July, with 235 volcanic earthquakes recorded in 24 hours. Ten were felt at intensities up to IV. AFP reported a 24 July COMVOL announcement that persons living within 4 km of Bulusan had been instructed to evacuate because of the earthquakes. On 27 July, 323 events were recorded and eleven felt, again at intensities of as much as IV. The swarm was continuing as of 29 July. Information Contacts: O. Peña, COMVOL, Quezon City; AFP. Occasional explosions continued through late August. Four explosions have occurred since last month, on 30 July (the strongest) and 1, 5, and 24 August. Ash-laden steam clouds rose 4-7 km above the summit, depositing ash as much as 14 km from the crater. The maximum measured ashfall thickness was 3.5 mm. The explosions were preceded by earthquakes of intensities I-IV on the MRF scale, continuing the seismicity that began on 6 July. As of 28 August, occasional felt events were continuing. Only one explosion was reported during September, a mild ash ejection on the 28th at 1155. The summit was covered by weather clouds, but seismographs in the area recorded the activity and villages in the SE sector of the volcano received traces of ashfall. The most recent ash eruption, on 28 September, was followed by a series of volcanic earthquakes that became less frequent with time. Felt events of intensity I-II on the MRF scale have also occasionally been recorded. 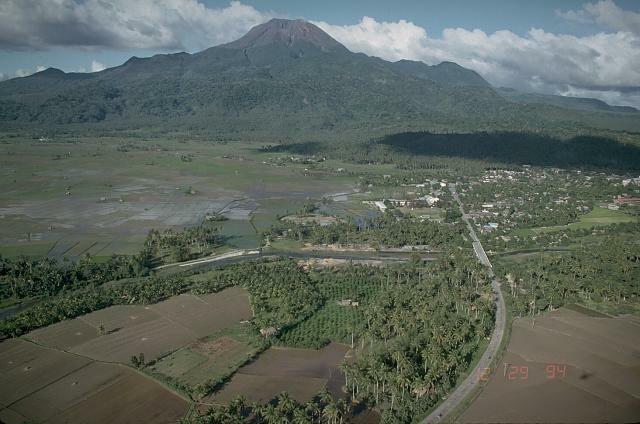 Bulusan began to eject ash on 9 April at 1008, its first such activity since 28 September 1980. Eruption clouds reached 4 km height and deposited 4 mm of ash on villages on the W side of the volcano. AFP reports that the 9 April eruption lasted about 8 hours. A second episode of ash ejection started 15 April at 1858. Lightning flashes were observed within the eruption clouds, which reached an approximate height of 8 km. Most of the ashfall was again on villages W of Bulusan, with accumulations of as much as 6 mm. An earthquake swarm began 20 April. During the next seven days, 1,812 events were recorded, 64 of which were felt at MM I-V on the Modified Mercalli Scale and were accompanied by rumbling. On 27 April at 1745, renewed explosive activity produced ashfalls on villages SW of the crater. Clouds obscured the summit, preventing determination of the eruption column height. Seismicity has declined since then. No additional eruptive activity had occurred as of 11 May. Seismographs registered a local earthquake swarm 30 June-4 July. Of the 700 recorded events, eleven were felt at intensities I-II on the MRF scale and seven others were accompanied by rumbling. No eruption took place. No eruption followed the 30 June-4 July earthquake swarm, and seismic activity at the volcano has remained relatively quiet since then. Mild phreatic explosions from the summit crater occurred at 0515 on 25 June and 0515 on 29 June. Eruption clouds reached heights of 1,000 and 1,200 m. Between 1 and 2 mm of ash fell on the NW quadrant of the volcano but no damage was reported. An intermittent increase in steaming from the summit crater and vents on the upper W flank was noted about a month before the eruption. A week before the first explosion, the temperature of hot springs 4 km S of the summit crater increased by 2°C and their discharge rate increased by 4 l/s. No increase in seismicity was noted. Information Contacts: O. Peña, PHIVOLCS, Quezon City. A seismic swarm began on 19 April at 2022 and lasted for ~ 10 hours. A total of 229 volcanic earthquakes were recorded by most of the five seismic monitoring stations. The initial phase was characterized by high-frequency volcanic earthquakes, gradually replaced by low-frequency volcanic earthquakes during the peak and latter part of the activity. Three of the events were felt, with epicenters initially located ~ 7.4 km SE (azimuth 134°) of the summit crater, within the caldera. No other significant change was observed. Steam emission remained weak and hot spring temperatures remained normal. Local seismicity gradually declined to a low level, with only 1 high-frequency volcanic earthquake recorded on 22 April. The last eruption of Bulusan, in June 1983, was not preceded by an increase in seismicity, but hot spring temperatures had increased several degrees. The April 1981 eruption, however, was preceded by an 8-day earthquake swarm. A seismic swarm following that eruption did not culminate in additional eruptive activity. Seismicity rose again to a high level on 5 May with two high-frequency and 18 low-frequency volcanic earthquakes recorded in the area of the volcano. The beginning of the swarm was accompanied by a slight increase in steam emission at an upper fissure. Five tectonic earthquakes with large maximum double amplitudes were recorded the same day. A total of 103 high-frequency and 308 low-frequency volcanic events were recorded by the 3-station seismic network during the entire crisis. This swarm occurred 55 days after the previous swarm on 3-21 March. A two-month recurrence had been recognized for seismic swarms prior to the May episode (figure 1). Figure 1. Seismicity at Bulusan, January 1986-May 1987. Courtesy of PHIVOLCS. Further Reference. Bautista, L.P., 1987, Volcano Update - Bulusan Volcano: PHIVOLCS Observer, v. 3, no. 2, p. 5. Strong volcanic earthquakes were detected by the single instrument in operation at Bulusan from 22 October to 3 December (typhoons damaged the remainder of the seismic telemetry network). High-frequency earthquakes with S-P intervals ranging from 2.0 to 2.6 seconds were recorded on 22, 23, and 31 October, and 3 December. The 22 October earthquake was felt at intensity II. Steam emission from the upper fissure remained white with the plume varying from wispy to weak. Thermal measurements showed no anomalous change. A mild ash ejection began on 20 February at 1945. Lightning flashes were observed near the summit during the activity, and hissing and rumbling were faintly audible from 2010 until 0600 the next morning on the W side of the volcano. A field investigation revealed traces of ash on W flank villages (Gulanggulang, 7 km SW of the summit; Bolos, 7 km W; and Sangkayon). No clear precursors were observed. Local seismicity had varied from 0 to 3 volcanic events/day, temperatures and chemistry of monitored hot springs showed no anomalous changes, and results of the latest EDM survey, in October, were within background levels. After the eruption, a white steam plume emerged from the vent under some pressure; during quiescent periods, only a wispy plume is usually emitted. Vapor emission from the upper end of a fissure was about half that of the steaming vent. Temperatures of hot springs remained stable. The single nearby PHIVOLCS seismograph (at San Benon, 5.1 km SW of the crater) recorded an indistinct explosion signal with the onset of ash ejection. An increase in local seismicity followed, as 29 low-frequency volcanic earthquakes (LFVE), 19 tremor episodes, and five explosion shocks were recorded during the remainder of the day. Only one LFVE was detected the next day (21 February), but a sulfurous odor was noted at Gulanggulang. Local seismicity increased again on 22 February, with 6 high-frequency volcanic earthquakes (HFVE) and 12 LFVEs. Amplitudes of the HFVEs were larger, but none were felt. A magnitude 6.9 regional earthquake was centered 80 km NE of Bulusan on 24 February and felt at Rossi-Forel intensity V in the Bulusan area; several aftershocks were also felt there. At about the time of the regional earthquake, a landslide was observed to have recently occurred on the volcano's middle to lower flank. The number of recorded local earthquakes reached a maximum the same day (80 events), and seismicity remained vigorous through the end of the month. Steaming from the upper end of the fissure varied from weak to moderate. Sulfurous odors and hissing sounds were often evident (at Gulanggulang; Angas, 2 km W; San Benon; and Cogon, 5 km SW). Small ash emissions occurred on 1 March, at 0502, 0552, 1458, 1510, 1523, 1528, and 1547, accompanied by rumbling sounds, explosion earthquakes, and several minutes of harmonic tremor. The ash plume ejected at 1458 reached 1 km above the crater; summit weather clouds obscured the morning plumes. Ash emitted in the morning was carried west by prevailing winds (to the villages of Gulanggulang, Sangkayon, and Puting Sapa). Afternoon ashfall was more extensive, and included the NW flank (reaching Aniog, 5.5 km NW; Rangas, 7 km NW; Bacolod, 6.5 km WNW; Puting Sapa; Buran-Buran; Sangkayon; Bolos, 7 km W; Guruyan, 9 km WSW; and Cogon). A small mudflow was observed at Cogon at 0700, consisting partly of ash ejected earlier that day. Some low-frequency harmonic tremor was detected after the 1 March explosions. Ash ejections resumed 6-8 March. On 6 March, a 1,500-m column was emitted at 1504, depositing ash to the W and SW (on the villages of Cogon; San Benon; Mt. Jormajan, 6 km WSW; Puting-Sapa; Gulanggulang; Monbon, 6 km SW; Gabao, 9.5 km WSW; and Tinampo). Additional ejections at 1521, 1525, 1536, 1606, 1649, and 2050 were recorded as explosion earthquakes. On 7 March at 1107, a 1,430-m-high ash cloud was observed from the SE flank village of Salvacion. Ejections continued that evening at 2013 and 2016 and early the next morning at 0030, 0249, and 0414. Ash again fell on the S and SW flanks (at Monbon, Gulang, Cogon, and Tinampo). Rumbling sounds accompanied all of the episodes except those on 7 March at 2013 and 8 March at 0030, when distinct explosions were heard by volcanologists at San Benon. Frequent seismicity continued, with a maximum of 58 tectonic earthquakes and 43 volcanic events on 7 March. PHIVOLCS noted that Bulusan's 1988 behavior remains similar to the 1980 activity, which lasted for 9 months, and more mild ash ejections are expected. High levels of seismicity have persisted at Bulusan for the past 2 months. Volcanic earthquakes averaged 70/day with peak numbers of events reported on 26 April and 9 June. Seismic activity has not been as high since 24 February when one large event of Rossi-Forel intensity V and 80 smaller events were recorded at Bulusan (13:2). On 26 April, 535 high-frequency and 37 low-frequency volcanic earthquakes, and one harmonic tremor episode were recorded by the San Benon Observatory (5.1 km SW of the crater). Three of these large-amplitude events were felt at intensity I (San Benon) and two events at intensity II (Bulusan Lake, 5.9 km SE of the crater). Several strong pulses of seismicity were noted in May and June: 1-11 May, 12-22 May, 25 May-1 June, and 5 June to July. These pulses may be attributed to fracturing within the caldera or within defined faults along the SE caldera rim. Epicentral plots clustered in two areas; one 6 km SE of the crater and the other 3 km NW of the crater. Depths ranged from 3 to 5 km. The seismic network recorded 233 volcanic earthquakes on 9 June. On 16 June, one of the day's 42 recorded volcanic events was felt at intensity I at San Benon, and on 17 June a tectonic earthquake was felt at intensity II at the Bulusan Lake Station. Steam emission generally was profuse. The latest EDM data (19 June) suggest a slight inflationary trend for Bulusan. The high levels of seismicity that have persisted at Bulusan since April continued with seismic swarms on 22-23 June, 15-17 July, and 27-28 July. High-frequency tremor with a maximum double amplitude of 2.5 mm was recorded during the 27-28 July swarm. During an 8-day period from 16 to 23 August, 804 volcanic events were detected by the seismic network. Hypocenters followed a general NW-SE trend with average depths of 7 km. Small-amplitude (1.5-2.5 mm) events were also recorded on 6 days in August, most recently on the 22nd. Steam emission remained moderate to profuse, rising to about 150 m above the active vent. The latest EDM measurements, on 17 August, indicated an inflationary trend. Further Reference. Bautista, L.P., 1988, The 1988 Bulusan Volcano Activity: PHIVOLCS Observer, v. 4, no. 1, p. 1, 3-4. A phreatic eruption at 2043 on 27 November sent an ash plume 1.5 km high that drifted W and SW, causing ashfall in six villages, and was accompanied by 14 minutes of felt tremor. Following this event, PHIVOLCS declared the area within 4 km of the crater off-limits. A second ash explosion on 3 December at 2348 was accompanied by rumbling, but details are sketchy owing to heavy cloud cover. The third ash ejection, on 4 December, deposited traces of ash ~7 km downwind; no other observations were possible. The next day, another explosion at 1227 sent ash 1.5 km high that caused ashfall 5 km WSW and was noticed in two villages. A phreatic explosion at 0650 on 12 December was also the strongest so far. The cauliflower-shaped eruption column, accompanied by a loud "pop," rose 3 km and deposited ash as far as 16 km SW. The main eruption column, light gray in color, rose vertically, and a smaller dark-gray surge cloud seemed to emanate from the base of the main eruption cloud. However, the runout was still within 4 km of the vent and no evacuation was recommended. Five additional small explosions occurred through 28 December. Observations of an ash explosion at 0155 on 18 December was hampered by clouds, but was inferred from the seismogram and ash deposits at 5 villages, all SW of the volcano. A minor ash explosion at 0807 on 20 December produced an ash cloud not directly observed due to rain clouds, but ash fell ~7 km SW of the vent. A brief cloud break enabled volcanologists to make a COSPEC measurement of ~370 metric tons/day. At 1525 on 23 December, a slightly stronger ash ejection lasted 4 minutes, causing light ashfall in 6 villages, also in the SW. Light ashfall 7 km from the summit was noted again the next day following a 3-minute ash ejection at 2153 on 24 December. Ash output from a 7-minute eruption at 1253 on 27 December seemed to be larger than other events and spread to a wider area, despite calmer winds, depositing small amounts of ash in nine villages. The onset of all ash emissions had a corresponding explosion-type earthquake recorded on the seismogram. This became diagnostic during heavy cloud cover when ash plumes could not be observed directly. Based on the earthquake amplitudes, the 27 November and 12 December events were the biggest explosions, although ash emission was greater on 27 December. In nearly each case, the ash deposit was <=2 mm thick at ~7 km downwind. Hazard maps had been prepared before the 27 November event. PHIVOLCS is planning to pull the telemetered seismic network installed on Mindoro for aftershock monitoring, and move it to Bulusan. Information Contacts: R. Punongbayan, E. Corpuz, and E. Listanco, PHIVOLCS; Reuters. The phreatic eruptions that started in late November seem to have slowed down, as evident from an apparent increase in intervals between ash explosions. There has been no great change in seismic character, with only a few daily earthquakes plus a few episodes of low-frequency tremor, some of which were probably related to steam jetting. An explosion at 2213 on 31 December ejected ash and was accompanied by rumbling and lightning flashes observed at Salvacion Monitoring Station (South). Areas affected were Cogon, Tinampo, Monbon, Bagsanga. Another ash explosion at 0008 on 7 January caused light ashfall at Barangay Cogon, Irosin (5-6 km from summit). At 1344 on 10 January, an ash explosion sent a plume 1 km above summit (1.5 km elevation) that drifted SSW. Very light ashfall was reported in villages up to 7 km SW.
Information Contacts: R. Punongbayan and E. Corpuz, PHIVOLCS. Phreatic activity that started in November continued through December and January (table 1). Another eruption on 21 January at 2237 generated rumbling noises, lightning flashes over the summit, and light ashfall at the San Benon Observatory, ~5 km SW. Based on the seismic record, this event was fairly strong, but ash deposits measured later that day (1-2 mm, 7 km downwind) were similar in amount to previous ash emissions. COSPEC measurements could not be undertaken because of heavy cloud cover. The interval between this ash eruption and the previous had increased, which, along with very low seismicity and ground deformation, may be taken as an indicative of decreasing activity. Alert Level 2 was maintained, which advises against anyone visiting within 4 km of the summit. This warning of heightened volcanic activity was non-committal about the timing of future events because seismicity and deformation have not changed prior to these short-lived ash eruptions. Table 1. Summary of recent phreatic eruption at Bulusan, 27 November 1994 to 28 January 1995. Data courtesy of PHIVOLCS. Another explosion on 28 January at 1433 produced a 2-km-high ash cloud above the summit craters and deposited andesitic ash (<=3 mm) on villages up to 15 km downwind. This event, recorded by the local seismic network as an explosion-type earthquake, was again preceded by low and unremarkable local seismicity; most earthquakes and short-duration tremor have occurred after each explosion. Ground deformation was also at background levels. Because no escalating activity has been detected, as of 1 February there was no change in 4-km-radius danger zone and no evacuation was recommended. No damage to crops or villages have been reported nor have there been any injuries as a result of these eruptions. Bulusan, after remaining relatively quiet since 1995, erupted multiple times during March and April 2006. There were no casualties or damage from these eruptions. On 21 March at 1044 the summit crater erupted, sending a column of ash 1.5 km into the sky accompanied by lightning and rumbling noises. Ash drifted N, W, and SW of the volcano and an hour after the event light ash fell on neighborhoods such as Barangays Cogon, Tinampo, Gulang-Gulang, and Bolos in the town of Irosin, as well as Barangays Puting Sapa and Bura-Buran in the town of Juban. Ash ejected at 1058 on 22 March coincided with an explosion-type earthquake. Three other earthquakes were recorded at 2330, 2332, and 2337. The hazard status had been raised to Alert Level 1; the area within a 4 km radius of the summit is a Permanent Danger Zone. On 29 April the volcano erupted in a similar fashion, emitting ash nearly 1.6 km into the air. There was no sign of lava and no reports of rumbling noises. It was reported that ash rained on nearby communities. Information Contacts: R.U. Solidum and E. Corpuz, Philippine Institute of Volcanology and Seismology (PHIVOLCS), Department of Science and Technology, PHIVOLCS Building, C.P. Garcia Avenue, Univ. of the Philippines Campus, Diliman, Quezon City, Philippines (URL: http://www.phivolcs.dost.gov.ph/); Inq7.net, a venture between The Philippine Daily Inquirer Inc., and GMANetwork Inc. (URL: http://news.inq7.net/). Bulusan erupted at 2258 on 21 March 2006, continuing into April 2006 (BGVN 31:04). Figure 2 shows the location of Bulusan volcano on the SE tip of Luzon. Figure 3 gives satellite measurements of SO2 one day after the eruption. Figure 2. Map of the Philippines showing the PHIVOLCS earthquake and volcano monitoring network, and Bulusan's location. Smaller inset focuses on the Bulusan region and indicates some settlements. The smaller map is from Encarta Maps; the larger map, courtesy of PHIVOLCS. Figure 3. Sulfur dioxide (SO2) emissions at 1345-1347 (local) on 22 March 2006 from Bulusan. The eruption was measured by the Ozone Monitoring Instrument (OMI) on NASA's EOS/Aura satellite [OMI detects the total column amount of SO2 between the sensor and the Earth's surface]. This cloud appeared quite significant (estimated total mass ~ 1,000 metric tons) considering that the event was reported as phreatic and that the image was collected about 15 hours after the eruption. Courtesy of Simon Carn. An ash eruption on 29 April did not cause any damage, but authorities asked people to avoid the region near the crater (figure 4). The current report stems in large part from information coming from The Philippine Institute of Volcanology and Seismology (PHIVOLCS). Table 2 provides a brief summary of 2006 activity and resulting plumes. Figure 4. Image of a light ash plume snaking W from Bulusan acquired at 1250 on 29 April 2006. The image was made by the Moderate Resolution Imaging Spectroradiometer (MODIS) on the U.S. National Aeronautics and Space Administration (NASA) Terra satellite. Courtesy of NASA Earth Observatory. Table 2. Bulusan explosive plumes recorded during 2006. Courtesy of PHIVOLCS. A phreatic ash explosion was recorded by the seismograph network at Bulusan between 2117 and 2130 on 25 May 2006. Light ashfall ranging from trace amounts to deposits 2 mm thick was reported from the W and SW villages of Bacolod, Sankayon, Puting Sapa, Rangas, Mapili, Caladgao, and Buraburan in the municipality of Juban, and Bolos in the municipality of Irosin, province of Sorsogon. PHIVOLCS reported that the ash explosion was more-or-less typical of activity at Bulusan during its current eruptive phase, and they expect more explosions to occur. Bulusan was at Alert Level 1, with a Permanent Danger Zone of 4 kilometers around the summit. The PHIVOLCS volcano alert signals range from Alert Level 1 (low-level unrest, no eruption imminent) through Alert Level 5 (hazardous explosive eruption in progress). An ash-and-steam cloud emitted from the volcano on 31 May 2006 (figure 5) resulted in light ashfall, from trace amounts to 1.5 mm thickness, in areas W and NW of the volcano. An ash-and-steam cloud from Bulusan on 7 June 2006 resulted in light ashfall 5 km N and trace amounts as far as 20 km N. The Alert Level was raised to 2, which means restricted entry within 4 km of the summit. On 10 June, an ash-and-steam cloud reached a height of ~ 1 km above the summit and drifted N and NE. The Manila Standard Today reported one death caused by an asthma condition aggravated by exposure to ash. Figure 5. A Bulusan ash explosion seen at 1617 on 31 May 2006. The event was photographed from the foot of the volcano, 5- 6 km from the summit, in the town of Irosin. Courtesy of PHIVOLCS. On 13 June 2006 at 1904, an explosion lasting ~13 minutes issued from a fissure W of the summit vent of Bulusan. It produced an ash-and-steam cloud (table 2). Ashfall up to 7 mm thick accumulated at the foot of the volcano in neighborhoods in the municipality of Juban. On 18 June at 1556 , an explosion lasted ~11 minutes; it produced an ash-and-steam cloud (figure 6). This was the 8th explosion since Bulusan reactivated in March. Ash up to 5 mm thick fell on a W-flank village. Figure 6. Mount Bulusan spews ash on 18 June 2006. Courtesy of Associated Press. On 20 June, a mild ash-and-steam explosion lasted approximately 17 minutes. The seismic network around the volcano recorded only one high frequency volcanic earthquake prior to the explosion. The ash and steam emission coincided with heavy rains that generated some lahars and torrential flows. The sulfur dioxide (SO2) emission rate that morning was 469 tons per day (t/d). At 0800 on 26 June 2006, PHIVOLCS reported that the Bulusan seismic network had recorded four volcanic earthquakes during the past 24 hours. Steaming activity was wispy to moderate and reached an approximate height of 50 m above the summit before drifting WNW. On 28 June 2006, PHIVOLCS reported at 0800 that continuous seismic observation at Bulusan disclosed one small explosion-type earthquake and two volcanic earthquakes for the past 24 hours. The explosion occurred at 0206 on 28 June and lasted for about 4 minutes. However, the event was not observed because the summit was cloud covered all of 27 June until early in the morning of 28 June. No ashfall was reported following the explosion, and no lahar occurred at Gulang-gulang River in Cogon, Irosin. Sulfur dioxide (SO2) emission rates of the volcanic plume measured on 27 June decreased slightly, to 597 tons per day (t/d) in comparison to the 26 June 2006 rate of 942 t/d. PHIVOLCS summarized the current 2006 activity as follows. In general, the character of explosions evolved only slightly, apparently becoming a little stronger later. The explosions in June were also somewhat longer in duration than earlier ash ejections, based on instrumental records and general visual monitoring. However, the absence of earthquakes, tremor, and generally low SO2 emission rates prior to each explosion suggested an absence of a large or active magmatic intrusion into shallow depths. Instead, they interpreted the sequence of explosions since March 2006 as pointing to interaction of small volumes of magma with an overlying water-saturated zone beneath the summit. These were thought to develop overpressures released during each explosion. It remains to be seen if the recent explosions would provide an "uncorking effect" and induce a major hazardous eruption. The very low earthquake activity was taken to suggests otherwise. Information Contacts: Philippine Institute of Volcanology and Seismology (PHIVOLCS), PHIVOLCS Building, C.P. Garcia Avenue, U.P. Campus, Diliman, Quezon City, PHILIPPINES (URL: http://www.phivolcs.dost.gov.ph/); Earth Observatory, National Aeronautics and Space Administration (NASA) (URL: http://earthobservatory.nasa.gov/NaturalHarards/); The Manila Standard Today (URL: http://manilastandard.net/); Simon Carn, Joint Center for Earth Systems Technology (JCET), University of Maryland Baltimore County (UMBC), 1000 Hilltop Circle, Baltimore, MD 21250. On 19 March 2006, the Philippine Institute of Volcanology and Seismology (PHIVOLCS) raised the status of Bulusan from Zero Alert (no alert) to Alert Level 1 to reflect elevated seismic, fumarolic, and other unrest (BGVN 31:05). From that date until an ash explosion on 28 June 2006, 10 explosions were recorded (see table 3). Table 3. Summary of significant events through late July 2006 at Bulusan . Numbering of explosion-type (E-type) quakes began 21 March 2006. Courtesy of Philippine Institute of Volcanology and Seismology (PHIVOLCS). 19 Mar 2006 -- -- -- Seismic swarm which lasted until 21 Mar; Alert Level raised to 1. 21 Mar 2006 2258 1.5 km N, W, SW 1st explosion-type (E-type) earthquake lasted 20 min; total of 4 E-type earthquakes recorded. 08 Apr 2006 2000 -- -- Lahar at Cogon spillway. 09 Apr 2006 1036-1058 -- -- Lahar at Cogon spillway. 29 Apr 2006 1044 1.5 km WSW, NW 2nd E-type earthquake; total of three E-type earthquakes recorded. 25 May 2006 2117-2130 -- -- 3rd E-type earthquake; ash deposits, trace to 2 mm thick in Juban, Irosin. Cloud-covered summit. 31 May 2006 1617 1.5 W, WNW 4th E-type earthquake. 07 Jun 2006 2017-2030 2.0 N, W, SW 5th E-type earthquake; smaller E-type earthquake at 0225 on 8 Jun; Alert Level raised to 2. 10 Jun 2006 1218 1.0 NE, E 6th E-type earthquake, lasting 25 min. 13 Jun 2006 1904 1.5 NW 7th E-type earthquake, lasting 13 min. 18 Jun 2006 1556 1.5 W 8th E-type earthquake. 20 Jun 2006 2013 -- -- 9th E-type earthquake ? mild; event not observed; seismic signal recorded for 17 min; rains generated some lahars. Cloud-covered summit. 24 Jun 2006 2300 -- -- Lahar at Cogon spillway. 28 Jun 2006 0206 -- -- 10th E-type earthquake; the associated volcanic event was not observed but seismic signal recorded as E-type earthquake lasted 4 min. Cloud-covered summit. 29 Jun 2006 0800 -- -- Continuous decline in activity; Alert Level lowered to 1. After the ash explosion of 28 June 2006, Bulusan's monitored parameters gradually decreased to near baseline levels. The daily count of volcanic earthquakes was very low, and SO2 emission rates and ground-deformation data revealed the volcano's deflated condition, indicating the absence of active magma ascent. Ash emission stopped and steaming from the active vents and fissures gradually returned to normal levels. Due to the decline in activity, on 29 July PHIVOLCS lowered the status of Bulusan from Alert Level 2 to 1. On 10 October 2006 at 1256 UTC, the Tokyo Volcanic Ash Advisory Center announced that an eruption plume from Bulusan was visible on satellite imagery reaching altitudes of 3 km and drifting SW and SSE. Unlike nearby Mayon volcano (~ 70 km NW) (see BGVN 31:08), no thermal anomalies were detected at Bulusan by satellite or recorded by the Hawai'i Institute of Geophysics and Planetology (HIGP) MODIS/ MODVOLC web site from the beginning of 2006 to 10 October 2006. Information Contacts: Philippine Institute of Volcanology and Seismology (PHIVOLCS), University of the Philippines Campus, Diliman, Quezon City, Philippines (URL: http://www.phivolcs.dost.gov.ph); Tokyo Volcanic Ash Advisory Center (VAAC) (URL: http://www.jma.go.jp/jma/jma-eng/jma-center/vaac/index/html); HIGP MODIS Thermal Alert System, Hawai'i Institute of Geophysics and Planetology (HIGP), University of Hawaii at Manoa, 168 East-West Road, Post 602, Honolulu, HI 96822, USA (URL: http://modis.higp.hawaii.edu/). Activity declined at Bulusan in late June 2006 after a series of 10 explosions that began on 19 March 2006 (BGVN 31:09). Between 30 August and 1 September steam plumes reached up to 350 m above the summit; the plumes drifted NW and SE. This report summarizes Bulusan's activity from 10 October 2006 through 12 May 2007 (table 4). Hazard maps created by the Philippine Institute of Volcanology and Seismology (PHIVOLCS) illustrate the risks to the large numbers of cummunities in the vicinity of the volcano (figure 7). Review of the available MODIS data indicates no thermal alerts during the year prior to 31 May 2007. Table 4. An overview of Bulusan's activity, as noted by PHIVOLCS during 10 October 2006 through 12 May 2007. Courtesy of PHIVOLCS. 10 Oct 2006 3 km SSW and SE Irosin: San Benon, Sto. Domingo, and Patag, Bulusan: Bulusan Proper, San Roque, San Rafael, San Francisco, and Dangkalan. Accompanied by rumbling sound. 19 Oct 2006 -- -- Irosin: Monbon, Gulang-Gulang, Cogon (traces of ash); Tinampo (0.5 mm thick ash). Not observed, but recorded as explosion-type earthquake lasting for 2 minutes. 23 Oct 2006 1 km SE and SW Irosin: Monbon and Tinampo (0.5 mm thick ash); Gulang-Gulang, and Tinampo (trace). Accompanied by rumbling sounds. 30 Oct 2006 ~1 km N and NW Light ashfalls (trace to 1.0 mm): Casiguran: Inlagadian, San Juan, Casay, and Escuala; Gubat-Bentuco, Tugawe, Benguet, Rizal, Buenavista, Ariman, Tabi, Bulacao, Naagtan, Panganiban, Carriedo, and Gubat proper. Series of three explosion explosion-type earthquakes lasting 35 minutes, accompanied by rumbling sounds. 31 Oct 2006 0.7 km N and NE Casiguran: Inlagadian. Small tremor that lasted for ~8 minutes. 31 Oct 2006 -- -- Irosin: Patag and Mapaso. Not observed due to thick cloud cover; recorded as explosion type earthquake. 21-28 Nov 2006 -- -- -- Seismic swarm - total of 170 events in three days; majority of epicenters more than 2 km away from the summit; 16-87 earthquakes daily. 20 Dec 2006 -- -- Irosin: ashfall at Monbon (1.5 mm), Buenavista (1.5 mm), Salvacion (2.5 mm), Casini (4.0 mm), Patag (trace), Santo (Sto.) Dmingo (trace), Tulay (3.0 mm), Poblacion (0.5 mm), and Bulan-Trece and Gate (trace). Explosion-type earthquake for 20 minutes, accompanied by rumbling sound and lightning flashes. 24 Jan 2007 -- -- Traces of ash in Irosin: Cogon, Monbon, San Benon, Gulang-Gulang (including Sito Omagom) and Tinampo. Explosion-type earthquake for 10 minutes. 26 Jan 2007 1.0 km SW Irosin: Barangay Monbon. Explosion-type earthquake lasting for 10 minutes. Feb-Mar 2007 -- -- Areas SW of the volcano. Dirty white moderate to voluminous steam emission, no seismic record of ash explosion. 07 Apr 2007 -- -- -- Increase in number of volcanic earthquakes; total of 68 events for two days. 08 Apr 2007 4.0 SW Irosin: Mombon, Tinampo, Cogon, Gulang-Gulang (including Sitio Omagom), Bolos, and Sangkayon; Juban: Bura-buran and Bacolod; Magallanes: Siuton; Bulan: Cadandanan, Busay, Palale, San Francisco, and Sumagongsong. Explosion-type earthquake for 27 minutes. 09 Apr 2007 -- -- -- Not seen, but recorded as explosion-type earthquake lasting for 20 minutes, accompanied by rumbling sounds. 09 Apr 2007 -- -- -- Not observed, but recorded as explosion-type earthquake for 20 minutes. 17 Apr 2007 -- -- -- Increase in number of volcanic earthquakes; total of 35 events for 24 hours. 12 May 2007 4.0 WSW, WNW Trace to 2 mm of ashfall. Irosin: Cogon, Gulang-Gulang, Tinampo, Bolos of Irosin. Juban: Bura-buran, Sangkayon, Bacolod, Puting Sapa, Aniog, and Sitio Cawayan (Bgy. Guruyan). Event accompanied by rumbling sounds; recorded as explosion-type earthquake lasting for 35 minutes; elevated numbers of volcanic earthquakes. Figure 7. Hazards maps for Bulusan showing susceptibility to pyroclastic flows and surges (left), and lava flows and lahars (right). Courtesy of PHIVOLCS. PHIVOLCS reported an explosion from Bulusan on 10 October that produced an ash-and-steam plume that rose to 4.5 km altitude and drifted mainly SE and SSW. Light ashfall (1.5-5.0 mm thick) was reported in neighboring towns downwind. Based on seismic data, the activity lasted for 9 minutes. On 11 and 12 October, steam plumes drifted SW and SSW. Another explosion occurred on 19 October. The following day, steam plumes drifted W and WSW. On 23 October, an explosion produced a brownish ash plume that rose to about 2.6 km and drifted SE and SW. Light ashfall (trace to 0.5 mm thick) from the 19 and 23 Cctober explosions was reported from neighborhoods in the municipality of Irosin, about 7 km S of the summit. During 25-26 October, PHIVOLCS reported a lahar that deposited sediments 15 cm thick along a tributary leading to the Gulang-gulang River. According to news articles, the lahar mobilized boulders as large as trucks and caused at least 96 people to evacuate. During 30-31 October, ash explosions generated a light gray ash-and-steam plume that rose to 2.3 km and drifted NNE. Later field inspection revealed ashfall (trace to 1 mm) N of the volcano, as well as in the municipalities of Casiguran and Gubat, about 12 km SSE and 18 km NNE, respectively, from the summit. Two explosion-type earthquakes recorded late on 31 October were followed by ashfall in Casiguran, Malapatan, and Irosin. News articles and wire services reported that Bulusan emitted ash accompanied by rumbling noises and lightning flashes on 20 December. Clouds hindered a view of the summit. Ash deposits up to 4 mm thick were noted in several villages in the foothills. A news report in News Balita noted a plume of gas and "white ash" on 22 December. In January 2007, PHIVOLCS reported that an explosion from the summit on 24 January lasted about 10 minutes, based on seismic interpretation. Observation was inhibited due to cloud cover. Ashfall was reported SW of the volcano. On 15 March, news media reported that ash fell on Bulusan's SW slopes and nearby villages. A resident volcanologist stated that ashfall was caused by voluminous steaming during 12-15 March, not explosions. Other news articles stated that eruptions on 8 April produced ash plumes that rose to altitudes of 3.1-6.6 km. 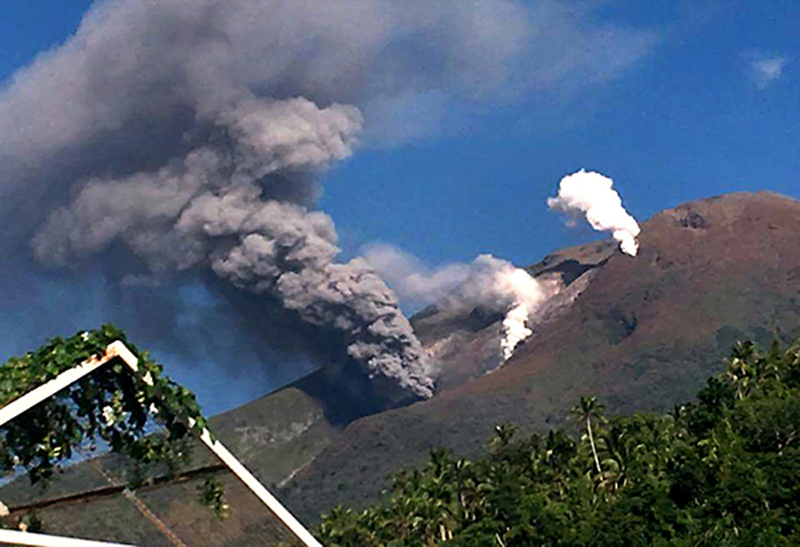 PHIVOLCS reported another ash explosion on 12 May 2007 with an eruption column reaching a maximum height of 4 km above the summit before drifting to the WSW and WNW. The activity was accompanied by rumbling sounds and was recorded by the seismic network as an explosion type earthquake that lasted for about 35 minutes. Prior to the explosion, during 9-12 May, an increase in the daily number of volcanic earthquakes was noticed, with 42, 65 and 97 events recorded. Information Contacts: Philippine Institute of Volcanology and Seismology (PHIVOLCS), University of the Philippines Campus, Diliman, Quezon City, Philippines (URL: http://www.phivolcs.dost.gov.ph); Tokyo Volcanic Ash Advisory Center, Tokyo, Japan (URL: http://www.jma.go.jp/jma/jma-eng/jma-center/vaac/index/html); Inquirer.net, Philippines (URL: http://www.inquirer.net/); Associated Press (URL: http://www.ap.org/); News Balita, Philippines (URL: http://news.balita.ph/). Our last report on Bulusan described explosive eruptions and ashfall during 10 October 2006 to 12 May 2007 (BGVN 32:04). This current report will cover the events from late May 2007 to January 2008. There were ash-bearing eruptions on 31 July and 4 October 2007. Hazard concerns also included steam-driven explosions, lahars, and related flooding. The Philippine Institute of Volcanology and Seismology (PHIVOLCS) reported on 20 May 2007 that seismicity remained high following an explosion on 12 May (BGVN 32:04). The seismic network detected 673 volcanic earthquakes during five days. The epicenters were located along a NW-SE trend. Ground deformation measurements conducted on 17 May on the NE flank revealed 4 mm of inflation since 7 April, measurements in a series which have shown continued inflation since June 2006. Sulfur dioxide flux measurements were 165-315 tons per day (t/d), below a baseline level of 500 t/d. The Alert Level was raised in mid-May from 1 to 2 (out of 5) due to the increased seismicity and inflation. On 22 May, heavy rain triggered lahars, but they were confined and did not affect populated areas. On 25 May 2007 sulfur emission reached 500 t/d. During mid-2007, scientists from PHIVOLCS conducting an aerial investigation discovered lahar deposits and three steaming fissures. Scientists also observed steam plumes that rose to altitudes of 1.6-1.7 km and drifted NW and NE. The S flank had inflated by 3 mm. Residents near the base of the volcano noted the odor of sulfur dioxide. No significant activity was reported during June 2007. Steaming from the active vents and fissures generally consisted of weak to moderate emissions of steam. On 13 July 2007, PHIVOLCS lowered the Alert Level to 1 due to a decline in activity including decreased seismicity, and lower than baseline sulfur dioxide emissions. On 19-21 June the NE and SE flanks were deflated when compared to previous surveys. Sulfur dioxide emission rates were 50-400 t/d. On the morning of 31 July 2007 an explosion produced an ash plume that rose to an altitude of 6.6 km and drifted WSW and WNW. Initial field reports indicated that light ashfalls were experienced in Cogon, Gulang-gulang, Puting Sapa, Bolos, Monbon and Gabao in Irosin, and Sangkayon and Buraburan in Juban. Small to moderate sized earthquakes and ash explosions continued. On 2 August, white steam plumes rose from active craters and fissures. On 28 September 2007 the number of volcanic earthquakes increased and PHIVOLCS noted a possible eruption. Explosions at 0134 and 0139 on 4 October 2007 caused a blanket of thick ashfall in sixteen villages that resulted in minor injuries and damage. Instruments recorded 40 volcanic earthquakes and eight short harmonic tremors during a 24 hour interval ending at 0526 that day. Moderate steaming from fissures were found on the SW flank. According to the news source Southen Luzon Bureau, on 15 October 2007 PHIVOLCS found an additional six points of emission around the volcano, three each on the NW and SE slopes. Several other emission points had stopped on the N, SSW, and SW slopes. Overall, nine emission points were active. News reports also mentioned that residents in the village of San Rogue noted bulging of the ground. A deformation survey was allegedly conducted, but results were not available in PHIVOLCS reports. In the 24 hours from 0800 on 6 January 2008, at least seven minor earthquakes were recorded, but no steaming was noted. Although the Alert Level remained at 1, authorities began to enforce a no-entry policy in a 4-km radius. Information Contacts: Philippine Institute of Volcanology and Seismology (PHIVOLCS), University of the Philippines Campus, Diliman, Quezon City, Philippines (URL: http://www.phivolcs.dost.gov.ph); Southern Luzon Bureau, Philippine Daily Inquirer, PO Box 2353, Makati Central Post Office, 1263 Makati City, Philippines (URL: http://newsinfo.inquirer.net/). The current report describes activity at Bulusan during 2008 through early March 2011, an interval punctuated by seismic signals indicative of explosions and occasional cases where ash fell up to 70 km away. During 2007, there were explosions, ash and steam plumes, and some ground inflation (BGVN 33:02). Quiet during 2008 through October 2010. According to the Philippine Institute of Volcanology and Seismology (PHIVOLCS), seismic events were infrequent after the middle of 2008 through 2009. In addition, ground deformation surveys in 2009 showed deflation of the volcanic edifice. These observations were indicative of a decline in the overall activity of the volcano. Thus, the Alert Level was lowered from 1 to 0 (out of 5) on 15 May 2009. Maps appear below (figures 8 and 9). Figure 8. Index map of Bulusan, a large stratovolcano located on the S portion of Luzon Island (Philippines). Courtesy of PHIVOLCS. Figure 9. Map showing monitoring network at Bulusan. Equipment includes seismic instruments (4 stations), EDM surveying instruments and reflectors, and benchmarks for precise leveling traverses (N and S flanks of volcano). Courtesy of PHIVOLCS. Quiet ends in November 2010. A volcanic, explosion-type earthquake occurred on 6 November 2010 coincident with a steam-and-ash plume that rose 600 m above the crater. Trace amounts of ashfall were reported in multiple areas 6-10 km NW. The Alert Level was raised from 0 to 1, and PHIVOLCS reminded the public not to enter the permanent danger zone, defined as a 4-km radius around the volcano. After 6 November and during late 2010 to early 2011, Bullusan experienced a number of earthquakes (table 5), and steam was often observed rising from the crater and known thermal vents, especially after an explosion. However, cloud cover frequently obscured the summit area. The Tokyo Volcanic Ash Advisory Center (VAAC) occasionally reported the presence of ash plumes (table 6). Table 5. Earthquakes at Bulusan recorded by the seismic network between 1 November 2010-8 March 2011. Based on reports from PHIVOLCS. Table 6. Volcanic ash emissions from Bulusan during 6 November 2010-26 March 2011. Based on reports from the Tokyo VAAC. The line indicated by "x" refers to an ash plume that was reported to authorities but not identifiable on imagery. On 7 November, PHIVOLCS noted that seismic activity had increased during the previous 24 hours. A phreatic explosion on 8 November produced a brownish-to-light-gray plume that rose 700 m above the crater. Several neighborhoods to the NW, W, and WSW reported ashfall. Steam rose from the crater after the explosion. On 9 November two consecutive ash explosions, accompanied by rumbling sounds, produced ash plumes that rose as high as 1 km above the crater and drifted SW. Ashfall up to 2 mm thick was reported in areas to the SW and WNW. On 11 November 2010, white steam plumes rose 150 m above the crater and drifted ENE. An aerial survey noted that recent explosions resulted in the joining of two of the 2006-2007 craters into one. PHIVOLCS scientists also found that deposits from an explosion on 9 November did not contain juvenile material. On 12 November an ash explosion produced an ash-and-steam plume that rose 700 m above the crater and drifted SW. Multiple neighborhoods to the W and SW reported light ashfall. During 12-14 November, some steaming from the crater was observed. An explosion late at night on 15 November was followed by ashfall in nearby neighborhoods. An explosion earthquake on 21 November 2010 was coincident with rumbling sounds and an ash plume that rose 2 km above the crater. Ashfall up to 3 mm thick was reported in multiple areas. According to news reports (Philippine Daily Inquirer), about 500 families evacuated and some local roads were impassable. On 24 November 2010, PHIVOLCS reported that an explosion, recorded for almost six minutes by seismographs, produced an ash plume that rose 1 km above the crater, drifted SW, and dissipated. Ashfall was not observed outside of the permanent danger zone, defined as a 4-km radius from the summit, suggesting that ashfall was confined to the upper flanks. On 26 November, an explosion-type earthquake was recorded. On 17 December 2010, PHIVOLCS reported that an explosion, recorded for about 3 minutes by seismographs, produced an ash-and-steam plume that rose 500 m above the crater and drifted SW. Another explosion on 23 December followed tremor that lasted for almost 31 minutes. A grayish steam-and-ash plume rose to about 500 m above the crater rim and drifted S-SW.
Seismic activity continued into 2011 with volcanic earthquakes, frequent steam emissions, and an occasional explosion. Tokyo VAAC reported ash plumes from Bulusan, although cloud cover frequently obscured the summit area. An explosion on 18 January 2011 was accompanied by a rumbling sound audible in Monbon, a barangay (neighborhood) in the municipality of Irosin, 6 km to the SW. Trace amounts of ashfall were observed in Monbon. A deformation survey conducted during 25-29 January showed slight deflation relative to a December 2010 survey. An explosion on 21 February 2011 produced a gray ash plume that rose ~3 km above the crater and drifted SW. Rumbling sounds were heard up to 10 km away in the town of Juban (NW). The event was recorded by the seismic network as an explosion-type earthquake lasting for about 19 minutes. Field investigations confirmed ash deposits in the towns of Irosin (up to 5 mm) 8 km SSW, and Bulan (up to 3 mm) 22 km SW. Traces of ashfall were also reported in the municipalities of Juban and Magallanes (24 km WNW), and in Masbate City, Masbate (70 km SW). According to news articles (Xinhua), about 2,000 people evacuated. There were 13 lahar-related seismic signals detected during 27-28 February 2011. Continuous heavy rain caused small lahars on the flanks and in river channels, including the Cogon and Monbon rivers to the SW. A map showing the susceptible lahar areas appeared in BGVN 32:04. Based on notices from the Manila airport and satellite image observations, the Tokyo VAAC reported that ash plumes were detected occasionally during and after the explosion of 6 November 2010. Table 6 denotes the substantial ash plumes reported by the Tokyo Volcanic Ash Advisory Center (VAAC) through 26 March 2011. During the reporting period, there were no thermal alerts derived from the Hawai'i Institute of Geophysics and Planetology Thermal Alerts System (MODVOLC). Information Contacts: Philippine Institute of Volcanology and Seismology (PHIVOLCS), University of the Philippines Campus, Diliman, Quezon City, Philippines (URL: http://www.phivolcs.dost.gov.ph/); Southern Luzon Bureau; Tokyo Volcanic Ash Advisory Center (VAAC), Tokyo, Japan (URL: http://ds.data.jma.go.jp/svd/vaac/data/); Hawai'i Institute of Geophysics and Planetology (HIGP) MODVOLC Thermal Alerts System, School of Ocean and Earth Science and Technology (SOEST), Univ. of Hawai'i, 2525 Correa Road, Honolulu, HI 96822, USA (URL: http://modis.higp.hawaii.edu/); Philippine Daily Inquirer (URL: http://www.inquirer.net/); Xinhua (URL: http://www.xinhuanet.com/english2010/). This report summarizes activity at Bulusan from March 2011 through May 2016. Eruptive activity that began on 6 November 2010 with ash explosions was continuing in late March 2011 (BGVN 36:03), and ended on 16 May 2011. The volcano was quiet until renewed activity during 1 May-17 July 2015. Another brief eruption was noted on 22 February 2016. Activity typically includes phreatic explosions from the summit crater and flank vents, ash-and-steam plumes, and minor ashfall in surrounding villages. Information was provided by the Philippine Institute of Volcanology and Seismology (PHIVOLCS) and the Tokyo Volcanic Ash Advisory Center (VAAC). Activity during March-May 2011. Following lahars in late February 2011, the number of daily volcanic earthquakes dropped to six or fewer in the first week of March. This small daily number of events continued through early May, except for nine earthquakes reported on 26 April. During March through early May 2011, weak steaming from the SE and NW vents was only intermittently observed when cloud cover did not obscure the view. Steam emissions seen in late April from the NW and SE vents reached an approximate height of 50 m before drifting WSW. During six days in March and eight days in April the Manilla airport reported to the Tokyo Volcanic Ash Advisory Center (VAAC) that volcanic ash had been observed, but the VAAC could not identify ash in satellite data. A phreatic eruption occurred at the cloud-covered summit crater of Bulusan on 13 May 2011 at 0025 local time. Rumbling sounds from the explosion were reported up to 5 km away from the volcano. The explosion earthquake associated with this event lasted for 10 minutes. The seismic network had detected only 10 earthquakes in the preceding 24 hours. Field investigations conducted immediately after the explosion confirmed the presence of thin (0.5-2.5 mm) ash deposits reaching approximately 9 km away from the crater to the NW and SW. Eight barangays in the municipality of Juban NW of the volcano (Caladgaw, Rangas, Puting- Sapa, Sangkayon, Bacolod, Buraburan, Gurayan, and Aniog) and four in the municipality of Irosin SSW of the volcano (Cogon, Bolos, Umagom, and Gulang-gulang) reported light ashfall after the event. Eleven volcanic earthquakes were recorded in the 24 hours after the explosion, but only four more in each of the next 24-hour periods. A significant increase in the seismic activity occurred during the morning of 16 May when 80 volcanic earthquakes were detected. This number increased to 144 volcanic earthquakes for the next 24-hour period. Only weak to moderate steaming from the active vents was reported following the explosion through 16 May. After this, the frequency of volcanic earthquakes declined to baseline levels of 0-2 events per day. Short-lived swarms of 9-21 events were reported on 25 May, 10 August, 11 September, and 20-26 December 2011, and 22 January 2012. In April 2012 ground deformation surveys indicated that the edifice had deflated since late November 2011. This overall decline in activity led PHIVOLCS to lower the hazard status in April 2012 from Alert Level 1 to Alert Level 0 (on a 0-5 level scale), meaning no eruption was foreseen for the immediate future. Activity during May-July 2015. Bulusan remained quiet following the 13 May 2011 explosion until 1 May 2015, except for a single episode of increased seismicity (13 volcanic earthquakes over 24 hours) and minor inflation in mid-July 2014. A series of explosions during 1 May-17 July 2015 originated from the NW vent, generally sending ash plumes to heights of 150-250 m above the summit, with larger plumes rising 1-1.5 km on 16 and 19 June. A five-minute-long steam-and-ash explosion erupted from the cloud-covered summit in the morning of 1 May 2015 and was followed by strong to moderate steaming from the NW vent that reached 200 m high and drifted WNW. The explosion distributed traces of ash in the areas W and WNW of the volcano, affecting the barangays of Bolos, Cogon, Gulang-Gulang, Sangkayon, Tinampo, and Umagom up to 7 km to the SW, and barangay Putting Sapa up to 12 km to the NW. Only five volcanic earthquakes were detected during the week prior to the eruption by the seismic network, but 62 were recorded in the eight hours following the explosion. A second 3.5-minute-long steam-driven explosion occurred on 6 May at 2146 that sent an ash plume approximately 250 m high before it drifted W. Traces of ash were observed about 8 km SW in Sitio Tulay, Cogon, Monbon, and Tinampo. As a result of these two explosions, PHIVOLCS raised the hazard status from Alert Level 0 to 1. Between 6 May and 16 June the volcano was quiet with very few volcanic earthquakes and weak emissions of steam from the NW and SW vents that drifted SW or WNW. Precise Leveling surveys conducted in early May indicated very slight inflation relative to March surveys. Activity resumed with two steam-driven explosions on 16 June at 1102 and 1120. The first event lasted approximately 10 minutes and produced a 1 km high steam-and-ash plume which drifted WSW. Rumbling from the explosion was heard by residents of Cogon on the WSW slopes of the volcano. The second explosion lasted for about one minute. A two-minute explosion was reported during 18-19 June, but dense clouds obscured visual observations of the summit. A seven-minute-long phreatic explosion occurred at 1455 on 19 June, and produced a 1.5-km high ash plume that drifted WSW. A low-level ash cloud on the upper NW flank, possibly from a short pyroclastic flow, was also observed. Minor amounts of ash fell in the neighborhoods of Bacolod, Buraburan, Mapili, Puting Sapa, and Juban 11 km to the NW. The eruption was followed by a voluminous steam emission, rising 250 m before drifting SW. A smaller explosion on 21 June lasting 111 seconds generated a 150 m high steam-and-ash plume that drifted E. Trace amounts of ash fell up to 8 km east of the volcano in San Jose, San Francisco, Bulusan Proper, Sapngan, San Rafael, and Dapdap. In late June, weak to moderate steam plumes up to 100 m high were observed drifting from the WNW and SW vents. Precise leveling surveys in late June 2015 indicated very slight inflation of the volcano's edifice relative to May 2015. PHIVOLCS reported that at 1310 on 17 July a phreatic eruption from the active vent on its upper NW slopes was detected by the seismic network for 11 minutes and generated an ash plume that rose 200 m above the vent that drifted WNW before drifting further N and NE. Ashfall was reported in areas up to 18 km to the N and NE in the Sorsogon Province, including Inlagadian (municipality of Casiguran), Tigkiw, Tugawe, Nazareno, Bugtong and Rizal (municipality of Gubat), and Fabrica, San Isidro, Sta. Cruz, and San Ramon (municipality of Barcelona). The rumbling from the eruptions was audible up to 6 km from the summit. Activity during July 2015-February 2016. Following the 17 July 2015 explosive activity, seismic activity decreased to background levels of 0-5 daily events with intermittent spikes a few times a month to a maximum of 24 earthquakes. Precise Leveling surveys and continuous GPS data between August 2015 and December 2015 indicated slight inflationary changes of the volcano's edifice during that time. On 21 February 2016 the seismic network recorded 15 earthquakes, followed by two minor eruptions at 1501 on 22 February that generated a short steam-and-ash column approximately 500 m high from the WNW fissure vent. The eruption signal consisted of two earthquake events, a rock fracturing event, recorded as a high-frequency earthquake, followed by an explosion-type (low frequency) earthquake with a total duration of just over four minutes. Explosions were accompanied by a rumbling sound heard at Puting Sapa, Juban and Bolos, 12 km NW. Traces of volcanic ash were reported in barangays Putting Sapa, Sagkayon and Caladgao in Juban (12 km NW), and barangay Bolos in Irosin (8 km SW). Precise leveling survey results from 23-28 February 2016 indicated slight deflationary changes of the edifice relative to December 2015, consistent with ground deformation measurements from continuous GPS data through February 2016. Information Contacts: Philippine Institute of Volcanology and Seismology (PHIVOLCS), University of the Philippines Campus, Diliman, Quezon City, Philippines (URL: http://www.phivolcs.dost.gov.ph/); Tokyo Volcanic Ash Advisory Center (VAAC), Tokyo, Japan (URL: http://ds.data.jma.go.jp/svd/vaac/data/). 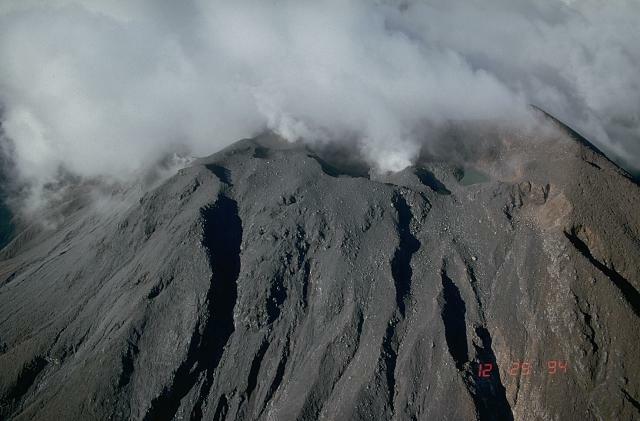 Recent eruptive activity at Bulusan included episodes during 6 November 2010-16 May 2011, 1 May-17 July 2015, and 22 February 2016; activity typically included phreatic explosions from the summit crater and flank vents, ash-and-steam plumes, and minor ashfall in nearby villages (BGVN 41:03). The most recent eruption began 10 June 2016 and continued through the end of the year. Information was provided by the Philippine Institute of Volcanology and Seismology (PHIVOLCS) and the Tokyo Volcanic Ash Advisory Center (VAAC). During the reporting period of June-December 2016, the Alert Level remained at 1 (on a scale of 0-5), indicating abnormal conditions and a 4-km radius Permanent Danger Zone (PDZ). Activity consisted of intermittent phreatic explosions generating emissions of ash and steam that typically rose 70-2,500 m above the summit crater (table 7). Minor ashfall in nearby municipalities often accompanied the explosions. In October 2016, PHIVOLCS extended the danger zone an additional 2 km as a result of a fissure that extended 2 km down the upper S flank; PHIVOLCS was concerned that active vents along the upper part of the SE flank could pose a greater risk to the populated barangays (neighborhoods) of Mapaso (Irosin), Patag (Irosin), and San Roque (Bulusan). The municipalities of Irosin and Bulusan are about 8 km SSW and 7 km ESE, respectively, of the volcano. Table 7. Summary of volcanic activity at Bulusan, June-December 2016. 10 Jun 2016 2,000 NW 5-min long phreatic explosion began at 1135 and generated ash plume. 19 Jun 2016 300 NW 7-min long phreatic explosion from NW summit vent began at 1303 and generated dirty-white ash plume. 23 Jun 2016 -- -- Dirty-white steam plumes from summit vent drifted down WNW flank. Minor ashfall on nearby municipalities NW. Sulfur odor. 25-26 Jun 2016 200 NW Steam plumes. 28 Jun 2016 -- -- Steam plumes drifted down flank. 05 Jul 2016 250 SSE, SSW Copious emissions of white-to-grayish steam plumes. 06 Jul 2016 700 -- Copious emissions of steam. 10-12 Jul 2016 70 -- Diffuse steam plumes. 20 Jul 2016 -- WNW White-to-light gray plumes at low levels. 21-25 Jul 2016 250 NW, SW Diffuse white plumes. 16 Sep 2016 1,500 NE 4-min long phreatic explosion began at 1654, and generated a dark gray ash plume. Ashfall in nearby municipalities NNW, NNE, and NE. 01 Oct 2016 200 SE White-to-grayish emissions during 0650-1240 rose from vents on SE flank. Minor ashfall in nearby communities. 06 Oct 2016 -- -- 15-min long minor phreatic explosion with ashfall on nearby municipalities. 12-16 Oct 2016 500 SE, SSE Steam plumes. 2-6 volcanic earthquakes per day. 17 Oct 2016 1,000 -- 24-min long phreatic explosion at the SE vent at 0736. 24 volcanic earthquakes 16-17 October. 19 Oct 2016 1,000 -- Phreatic explosion at 0458 from upper SE flank. Explosion-type earthquake lasted 9 min. 21 Oct 2016 -- -- 20-min long phreatic explosion from summit crater began at 1234. Minor ashfall in nearby municipalities. 23 Oct 2016 2,500 WSW 15-min long phreatic explosion from summit vent began at 1531 and generated an ash plume. Small pyroclastic flows traveled 2 km down flank. Trace ashfall in nearby municipalities. Another, much smaller, explosion at 1539 from SE vent generated ash plume that rose 500 m. Rumbling and sulfur odor noted in several nearby areas. 29 Dec 2016 2,000 WSW Phreatic explosion at 1440 from vent on upper SE flank generated grayish ash plume. Explosion-type earthquake lasted about 16 min. Minor ashfall on nearby municipalities. Sulfur odor noted. Ashfall. On 23 June 2016, minor amounts of ash fell in the barangays (neighborhoods) of Poblacion (11 km NW), Añog (12 km NW), and Bacolod (13 km NW), all in the municipality of Juban (about 12 km NW), and the municipality of Mabini (12 km NNW). A sulfur odor was detected in the neighborhoods of Mabini, Bacolod (Irosin), Añog (Juban), and Puting Sapa (Juban). On 16 September there was ashfall in the municipalities of Casiguran (11 km NNW), Gubat (18 km NNE), and Barcelona (14 km NE). Minor amounts of ash fell during 1 October in the barangays of San Rafael, San Roque, and San Jose, all in the municipality of Bulusan. A minor explosion on 6 October caused ashfall in some areas of the municipality of Gubat, and rumbling was noted in San Roque. A phreatic explosion on 21 October generated a plume that resulted in a thin layer of ash in Casiguran and Gubat, and trace amounts in barangays in Barcelona, Casiguran, and Gubat. On 23 October, a phreatic explosion produced trace ashfall in multiple barangays in Irosin; the most ash, 1 mm-thick deposits, were found in Puting Sapa (Juban). On 29 December, a phreatic explosion generated an ash plume that resulted in minor amounts of ashfall in areas downwind, including several Irosin barangays (Cogon, Tinampo, Bolos, Umagom, Gulang-gulang, and Monbon) and two Juban barangays (Caladgao and Guruyan). Residents of Guruyan, Monbon, and Tinampo noted a sulfur odor. Luzon's southernmost volcano, Bulusan, was constructed along the rim of the 11-km-diameter dacitic-to-rhyolitic Irosin caldera, which was formed about 36,000 years ago. It lies at the SE end of the Bicol volcanic arc occupying the peninsula of the same name that forms the elongated SE tip of Luzon. A broad, flat moat is located below the topographically prominent SW rim of Irosin caldera; the NE rim is buried by the andesitic complex. Bulusan is flanked by several other large intracaldera lava domes and cones, including the prominent Mount Jormajan lava dome on the SW flank and Sharp Peak to the NE. The summit is unvegetated and contains a 300-m-wide, 50-m-deep crater. Three small craters are located on the SE flank. Many moderate explosive eruptions have been recorded since the mid-19th century. Bautista L P, 1988. The 1988 Bulusan volcano activity. Phivolcs Observer, 4: 1-3. McDermott F, Delfin F G Jr, Defant M J, Turner S, Maury R, 2005. The petrogenesis of volcanics from Mt. Bulusan and Mt. Mayon in the Bicol arc, Philippines. Contr Mineral Petr, 150: 652-670. Mirabueno M H T, Okuno M, Nakamura T, Laguerta E P, Newhall C G, Kobayashi T, 2007. AMS radiocarbon dating of a charcoal fragment from the Irosin Ignimbrite, Sorsogon Province, southern Luzon, Philippines. Bull Volc Soc Japan (Kazan), 52: 241-244. There is no Deformation History data available for Bulusan. Bulusan volcano, seen here from the west, is the southernmost volcano on the island of Luzon. Bulusan, along with other cones and domes, is constructed within the 11-km-wide Irosin caldera. Frequent moderate explosive eruptions have been recorded since the mid-19th century from craters at the summit of the volcano. Photo by Chris Newhall, 1984 (U.S. Geological Survey). The south wall is the most prominent segment of the 11-km-wide Irosin caldera, and overlooks a broad, flat caldera floor below the active volcano of Bulusan. 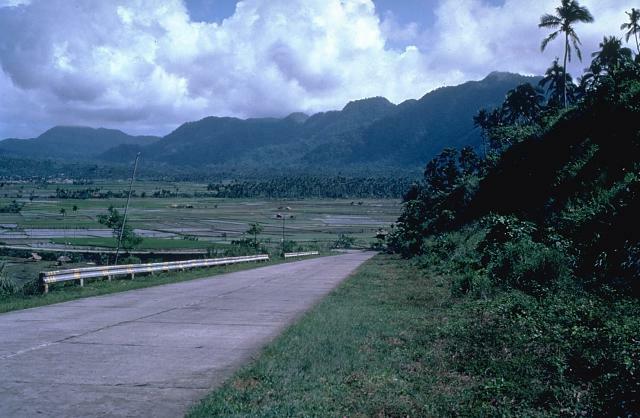 The northern caldera rim has been buried by the slopes of Bulusan and other post-caldera cones. Mount Jormajan, a large lava dome on the east side of Bulusan volcano, was constructed at the western side of the 11-km-wide erosion caldera. This view from the south shows the flat caldera floor in the foreground, with the western caldera wall visible at the extreme left. 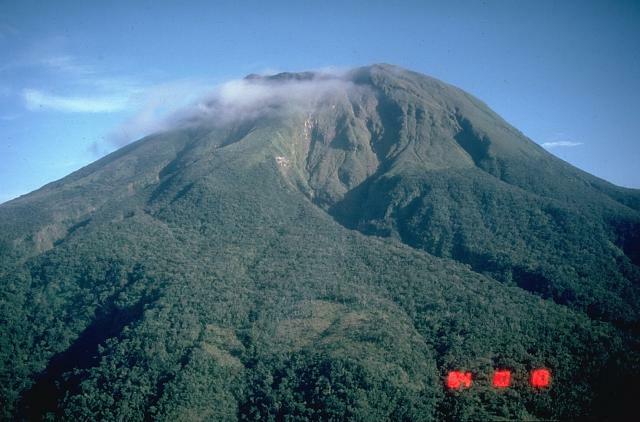 Frequent eruptions, recorded since the mid-19th century, have kept the summit of Bulusan volcano unvegetated. The principal summit crater is 300-m wide and 50-m deep. Two craters are located on the lower SE flank, the lower of which contains a crater lake. Bulusan, seen here from the south, rises to 1565 m above the low-lying floor of Irosin caldera. 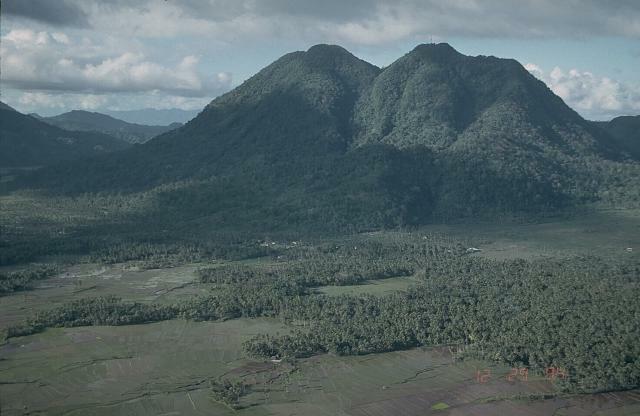 Bulusan is the youngest of several cones and lava domes constructed within the caldera. The city of Irosin (right) is the largest of several towns within the caldera, which was formed more than 36,000 years ago. Historical eruptions of Bulusan have been restricted to vents at the summit, although flank vents also are found low on the SE side. There are no samples for Bulusan in the Smithsonian's NMNH Department of Mineral Sciences Rock and Ore collection. Large Eruptions of Bulusan Information about large Quaternary eruptions (VEI >= 4) is cataloged in the Large Magnitude Explosive Volcanic Eruptions (LaMEVE) database of the Volcano Global Risk Identification and Analysis Project (VOGRIPA).